Whether you like your eggs scrambled, poached or sunny side up, Smoke House Deli adds some serious swag to the good old egg at their Wonderful Egg festival. With dishes ranging from classic to conventional, there is plenty and more to get eggcited about. Wanting to give customers a home-cooked experience, the menu starts off with a bit of spice in the form of Mommy Style Akuri a�� traditional Parsi scrambled egg with onions, tomatoes and coriander, accompanied with buttery fried bread. Innovatively using Maggi, the Truffled Ramen with Poached Eggs (or fried, if you prefer) includes noodles, tossed in some truffle oil with zucchini and tri-coloured capsicum to jazz things up. 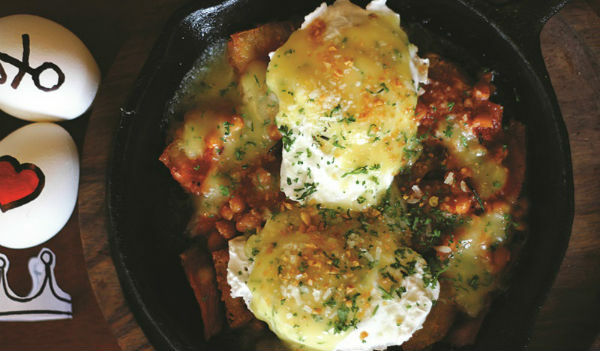 Giving a desi twist to the English classic eggs benedict is their Curry Benedict. Unfortunately not Benedict Cumberbatch on a platter, but poached eggs on a bed of hash browns and house sausages, it hasA� a rich curry sauce poured over it (ask for an extra drizzle). If you are not counting calories then be sure to try the Straw Potato Florentine. We loved the perfectly poached eggs on a base of creamy spinach. The addition of Parmesan cheese and crispy fried potato straws gave it the extra crunch it needed. We were then introduced to a burst of flavours with smoked salmon Kedgeree. The well-done boiled eggs were accompanied by perfectly seasoned rice with salmon. Sitting atop hash browns, baked beans and bacon, with hollandaise sauce drizzled over, the devilled eggs certainly make for a hearty meal. Be sure to add a fruity cooler to your meal, to cut the flavours.